95th and Metcalf was once home to a bustling mall that now lies vacant at one of the busiest intersections in Overland Park, Kansas. Originally opened in 1967, the Metcalf South Mall was once the most active mall in the Midwest. In February of 2014, LANE4 Property Group along with The Kroenke Group purchased the property along with the property directly to the north, formerly anchored by Kmart. 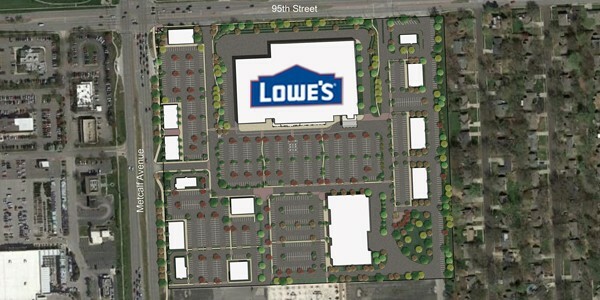 Set to break open in late 2018, 95Metcalf South will be anchored by a 121,000 square foot Lowe’s Home Improvement Store and includes an additional +/- 130,000 SF of retail space. 95Metcalf South is a prime location in a an outstanding community. The redevelopment is set to transform the once iconic intersection and rejuvenate the entire area. 95th Street and Metcalf Ave.